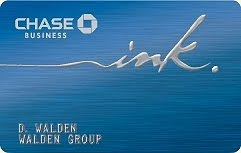 Chase has scaled back the zero percent introductory period for the Ink Classic and Ink Cash business credit cards. For both cards, the intro period was 0% on both new purchases and transferred balances for 12 months. It's now 6 months on purchases and balance transfers for both cards. A bit of a buzzkill, but both cards still offer a lot of value. And Ink Cash offers an extremely competitive cash back rewards program. Both Ink Cash and Ink Classic have no annual membership fee. No annual fee for the first year. We all know that the go-go days of easy credit are long gone. With this in mind, be sure that both your personal and business credit profiles are in tiptop shape before applying for any Chase business credit card or business charge card.